I first met Edward Martinez in the summer of 2006 at an artists residency at Forbes Trinchera Ranch hosted by Christopher Forbes and American Artist magazine. Along with eight other artists we spent ten days painting en plein air at various locations on the ranch. One of the things I remember most about Martinez was his incredible field work. One of his paintings was later chosen for the cover of the American Artist magazine that covered the event (the same painting was later chosen to represent the American Artist Special Edition on plein air painting in 2010). My wife and I later caught up with Ed and his wife, watercolorist Deborah Chabrian, in New York City where we had a group show at the Forbes Galleries in March 2007. BRAD TEARE One of the really amazing aspects of your plein air work is your ability to keep the darks really saturated and colorful. Even at a distance your work is always very rich. Is that something you think about in the field as you paint? Or is it a result of another focus, such as a concern with values? EDWARD MARTINEZ I think that darks and lights are hard to achieve in the field since you don't have the benefit of dry paint that would allow you to over paint . You have to get the values correct right away, or your painting will start to fall apart quickly. I start with my darks first, with paint slightly thinned with turps to establish my composition. Then I paint the darks in again, this time not thinned with turps, just straight from my palette. I apply it thinly, so that I can make subtle value changes easily. If you apply the paint too thickly you will struggle with making value and color changes, the changes get lost in the too thick paint. For judging the lights, I like to leave the white of the canvas showing somewhere, this helps me gauge the lightest values. In most cases this means the sky which is usually lighter than you think. I then paint in my lights at the very end. BRAD TEARE In blog entry number 5 I demonstrate how I use a nine value grayscale to identify values in the field. Have you used anything similar? What are the strengths and weaknesses of using such a method? EDWARD MARTINEZ I can't count while I am painting so I ignore how many values I have going on. I don't believe I paint with that sort of subtle nuances in plein air, but I think I will try your method. BRAD TEARE Do you have any special tools or supplies you feel gives you an added advantage? EDWARD MARTINEZ I used to use a canvas with deep nooks and crannies and it took forever to get paint to cover the surface. Now I use a smooth canvas the L600 oil primed mounted on gator board. The paint just flows on easily and allows you to articulate even the finest detail. I get this from AE Art Canvas in the Bronx, NY. I also like the "Silver" brushes, Grand Prix Flats in assorted sizes. BRAD TEARE When I'm painting en plein air my darks and lights have a tendency to lose their saturation and the painting takes on an overall gray appearance. Any ideas why that would happen? EDWARD MARTINEZ I talked a little bit about dealing with darks and lights in an earlier question, but it's worth mentioning to build up your paint gradually and carefully. A solid understanding of warm and cool colors helps too. Don't over use white too soon! BRAD TEARE When you are out in the field are there motifs you avoid? Is there a special time of day you prefer to paint? EDWARD MARTINEZ I used to paint cows... until I got chased by a bull. I just barely made it out of the field with my life and paint box. Definitely a motif I avoid. My least favorite time of day is mid afternoon. The sun isn't usually creating very interesting shadows at that time of day. BRAD TEARE How long does it take you to paint a painting en plein air? Obviously the light changes as you paint in the field. How do you compensate for that change? EDWARD MARTINEZ I work small, usually 9x12 and I spend about 2 hours. The light doesn't change too much in a 2 hour window. If the light changes and will enhance my painting I will go with it. BRAD TEARE Do you do a preliminary sketch before you begin painting on canvas? EDWARD MARTINEZ I don't... but I have. I have mixed feelings about this. I feel like I can make compositional changes in my thin paint lay in, therefore a sketch is not that necessary. BRAD TEARE Are there any plein air cliches that bother you? How do you avoid these cliches when you're out painting in the field? EDWARD MARTINEZ I don't think I know any. Is it that you have to wear a french hat and stay under an umbrella? BRAD TEARE How do your plein air methods differ from when you're painting in the studio? EDWARD MARTINEZ When I am painting in the studio I am usually painting portraits from photos, so I really enjoy going out and painting nature and finding the colors it offers. This has helped my painting overall including portraits. BRAD TEARE What would be the most important piece of advice you could give a beginning plein air painter? EDWARD MARTINEZ Learn to see multiple things at the same time. If you are painting a tree, don't just look at the tree, look at the environment around the tree so that your eye can register the true color and value in comparison to the surroundings. BRAD TEARE I really admire the way you painted the aspen in Deb Painting Spring Creek, 22” x 14”. They read as white yet there are warm and cool greens in the shadows and yellows in the highlights that make these trees appear fully saturated with light. It looks like you used anything but white. Do you view plein air painting as an exercise in accurately depicting the color you see? Or is it the ability to infuse the painting with optical illusions that give the appearance of reality? EDWARD MARTINEZ I have a tendency to paint too dark. I am getting better at it now so that I can see light color values better. Having the white of the canvas has helped me visualize the lights better. In the Aspen painting I just enjoyed seeing the variations of reflected color. The trees in Connecticut are for the most part dark and don't reflect light like the Aspens did in Colorodo. BRAD TEARE Did plein air painting come easily to you? Or was it something you consciously had to try to improve? Do you remember if there was a moment when you finally thought to yourself I finally figured this out!? If that was the case, what was the final piece of the puzzle that allowed you to come to grips with plein air painting? 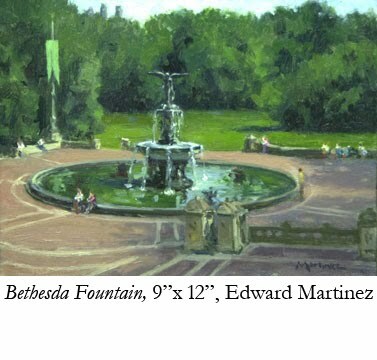 EDWARD MARTINEZ Plein air painting does not come easily to me even now. It did get better at it after painting at Trinchera, because we painted so much everyday, for many consecutive days. Once I could accurately see color values at the same time the world opened up. The canvas and brushes help too. BRAD TEARE Do you think about the texture of the paint as you apply pigment? Is texture ever a problem and do you ever consciously minimize thick applications? EDWARD MARTINEZ I only think about the application of paint in that, is it the right amount to let me define what I am trying to articulate? It needs to be the right consistency to draw and create the textures you need. Again I would say not to get too thick too soon. BRAD TEARE I'm looking forward to getting into the field to try these ideas. Many thanks Ed! EDWARD MARTINEZ studied at the Parson School of Design as well as with legendary painter Burton Silverman. He has worked as an illustrator for a wide variety of national and international clients. His fine art work is represented by The Gregory James Gallery, New Milford, CT, The Meyer Gallery, Santa Fe, and The Portrait Source, Hendersonville, NC. Martinez was one of ten artists invited to the 2006 Forbes Trinchera Ranch residency hosted by Christopher Forbes and American Artist Magazine. His paintings have appeared in numerous national exhibitions and publications including most recently the cover of American Artist’s 2010 Special Edition on Plein Air painting. Martinez was born in Argentina and currently resides in Kent, CT where he shares a studio with his wife, watercolorist Deborah Chabrian.